I am so proud of my husband K. Or maybe proud of myself. When we were first together, there were lots of things K and I did differently. Some is culture, some is personality, and some is just having different families. It has been fun blending our ideas, even when we disagree at times. I have talked before about how he wasn’t a big fan of leftovers as a dinner. Well, post baby, that has certainly changed. Leftovers are welcome almost any day (although we get tired of them, too, and definitely throw in new meals). Another dinner idea we disagreed on was a cold meal. It turns out, he either just needed some time to consider it more, or maybe it wasn’t a big deal in the first place? 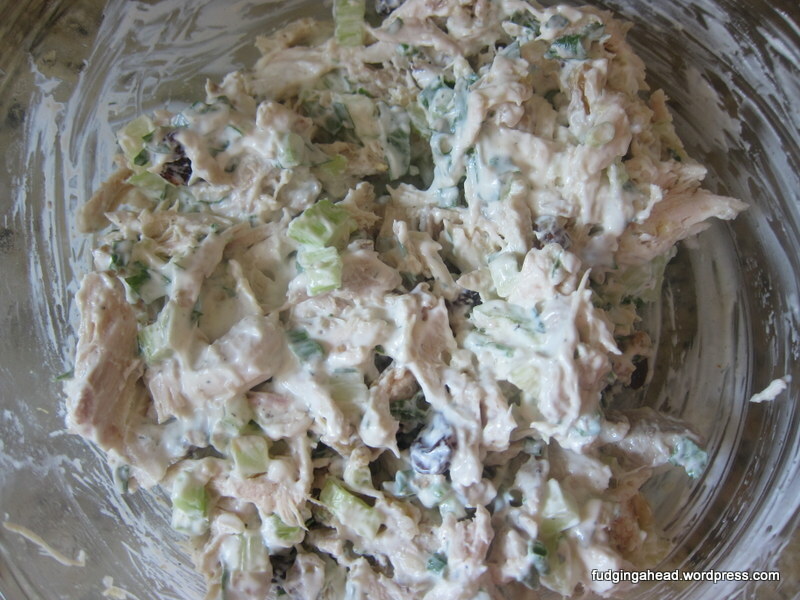 I proposed an idea for our leftover chicken meat: chicken salad sandwiches. I said it was okay if he wasn’t interested. Recently, at a friend’s party, we had chicken salad sandwiches with fruit and nuts in them. He hadn’t tried it that way before, and loved them. So, I was given the go-ahead…the only stipulation was that we serve it on toasted rolls (no complaints here). 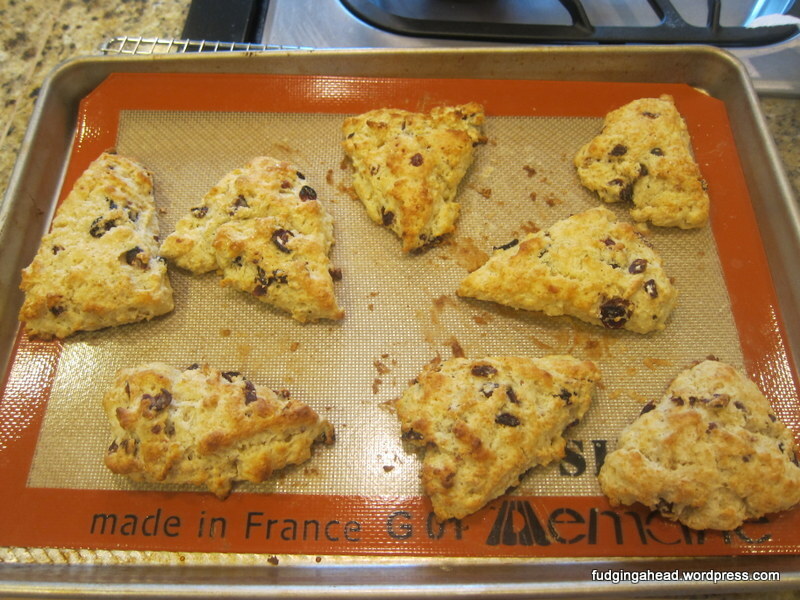 My dad is apparently a big fan of scones. 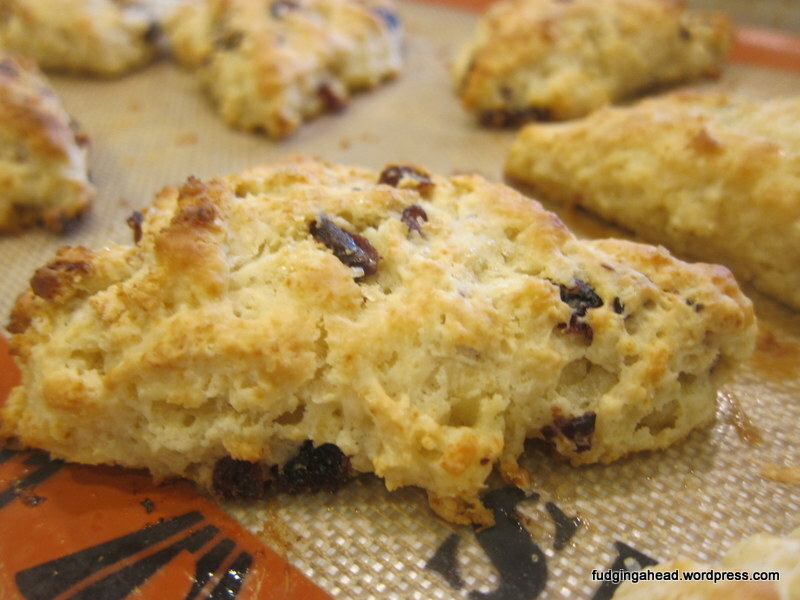 I started making scones about 4-5 years ago, and I have made many iterations since, mostly for him to try. 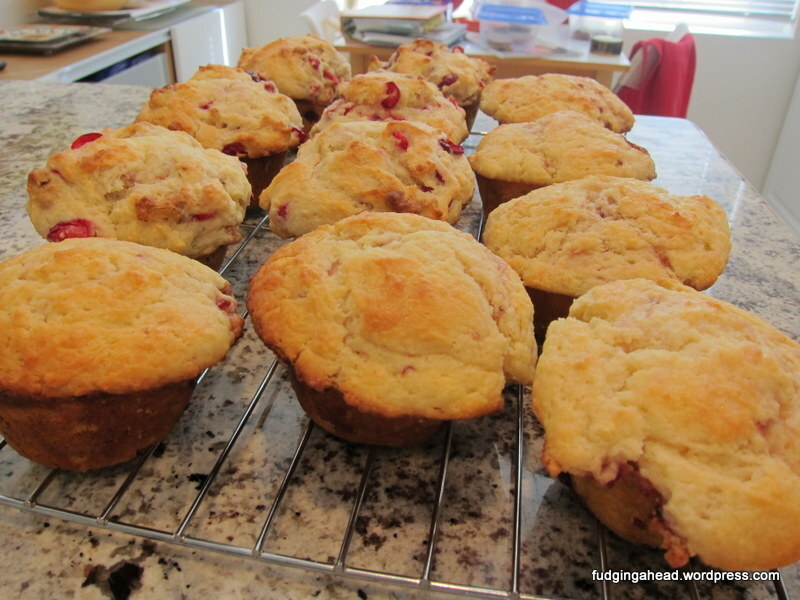 Not all of them have appeared on the blog, but today’s recipe needed to be seen. I liked it so much, I made it again within a week. 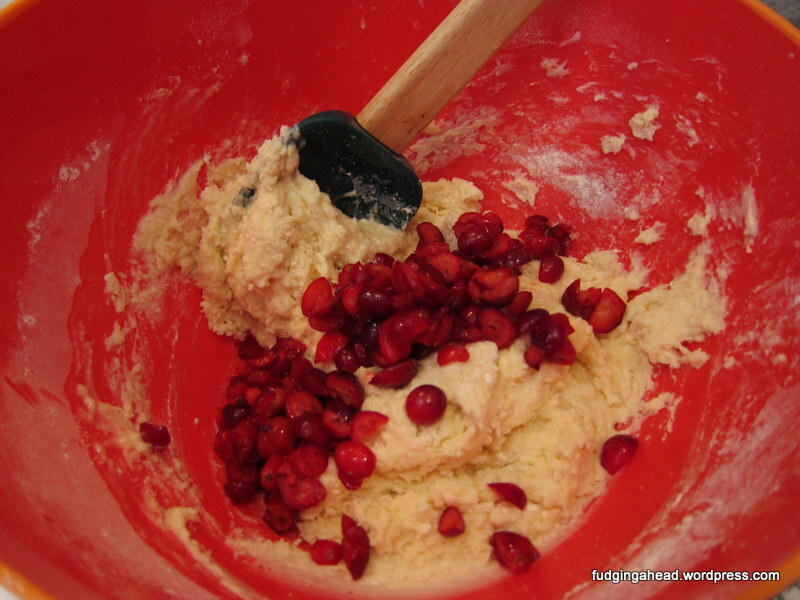 And then I made it with a different mix-in that I will share on Wednesday. Part of the reason I like it so much is that it is easy. 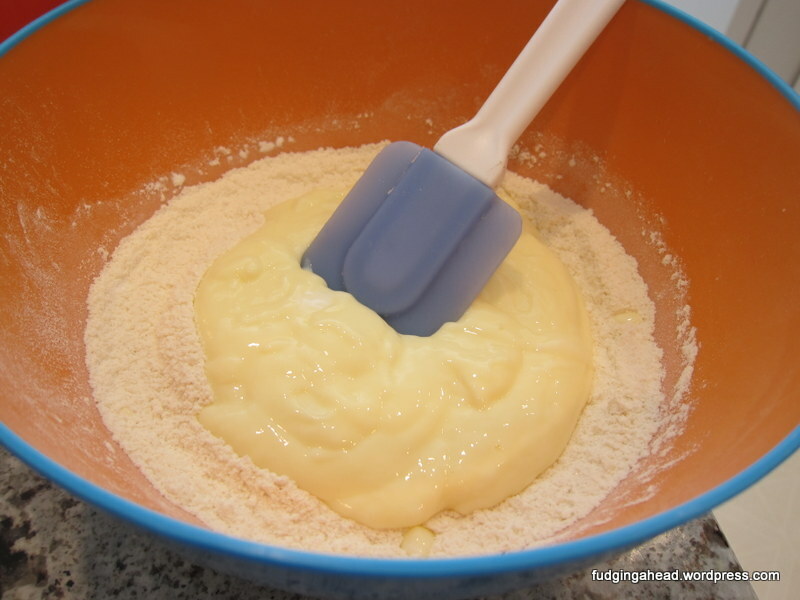 The food processor takes care of the bits of butter (and you really taste the bits in the final product) and a small bit of mixing takes care of the rest. I made these with the disc method, but the recipe on Wednesday will show what they look like if you just scoop out portions. Both were successful, but the scooping was a bit easier. So, feel free to take the easier way out, especially if you make these in the morning and are a bit sleepy still. 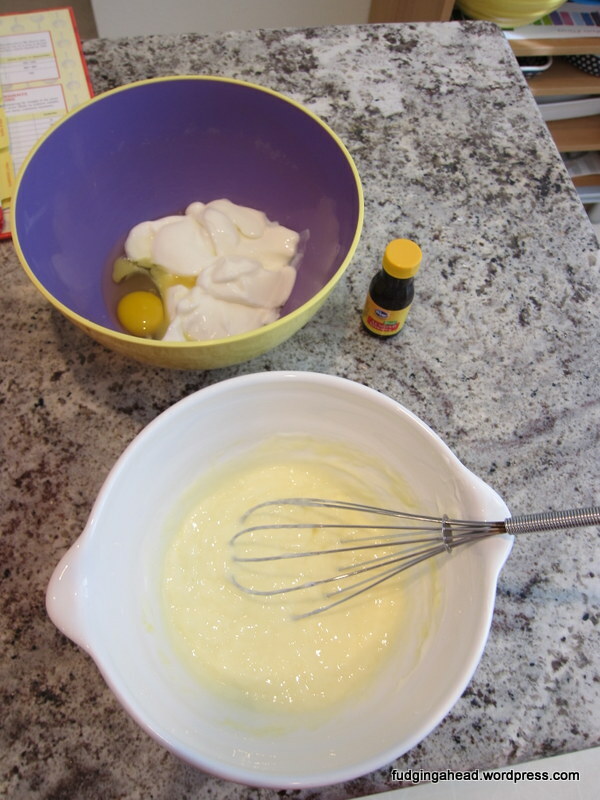 This recipe is a bit healthy (I used half and half instead of cream, and cut back on the butter). You won’t realize it and will enjoy them just the same. 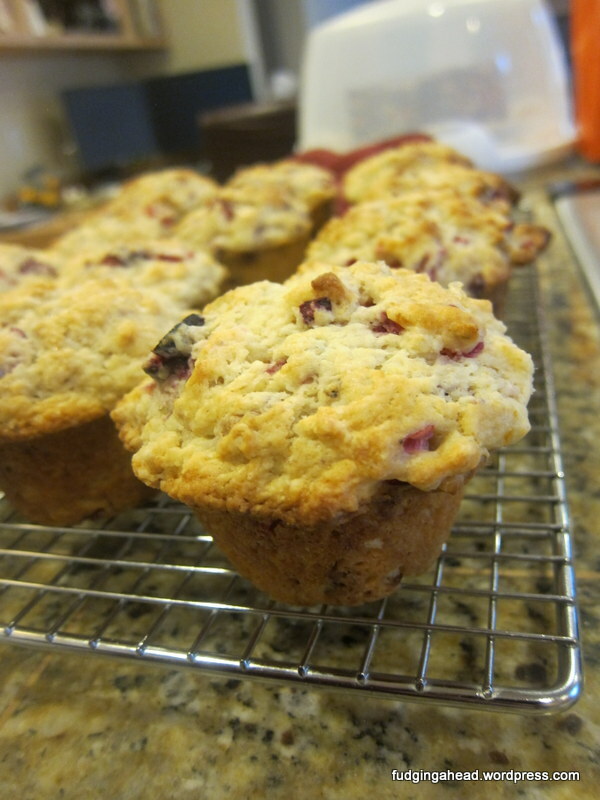 If you’re curious, I used dried cranberries from Trader Joe’s and they were really tasty in this. Not tart at all, if you’re worried about that. 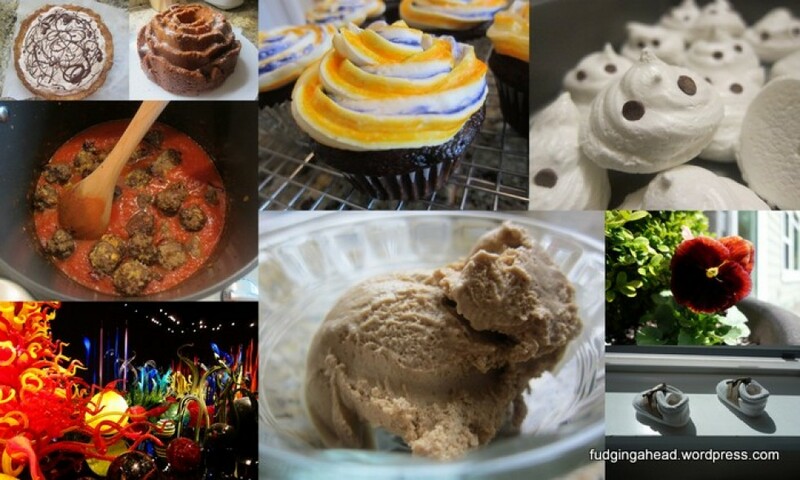 Originally today was going to be another recipe that was completely unrelated to the events of this past week, but when Joanna of Midwestern Bite sent me a message asking about my Thanksgiving and how it works with the combined cultures….well, I decided I could post about it and our combined cultural experiences. 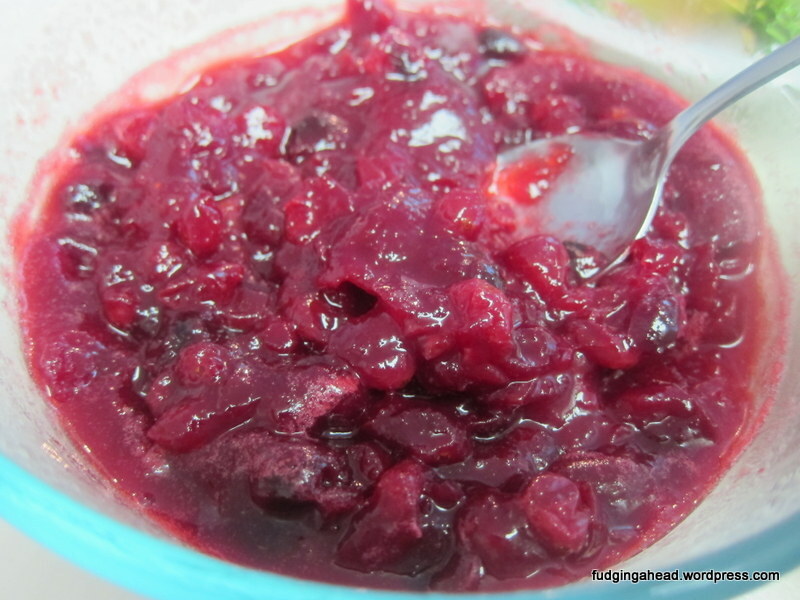 If you continue past the break, you will find the recipe for a boozy cranberry sauce. That’s right, you get two lemonades for the price of one post! The sight of Meyer lemons inspired donuts, and they also inspired lemonade. I squeezed extra lemon juice when I made the donuts so that I could make some lemonade. 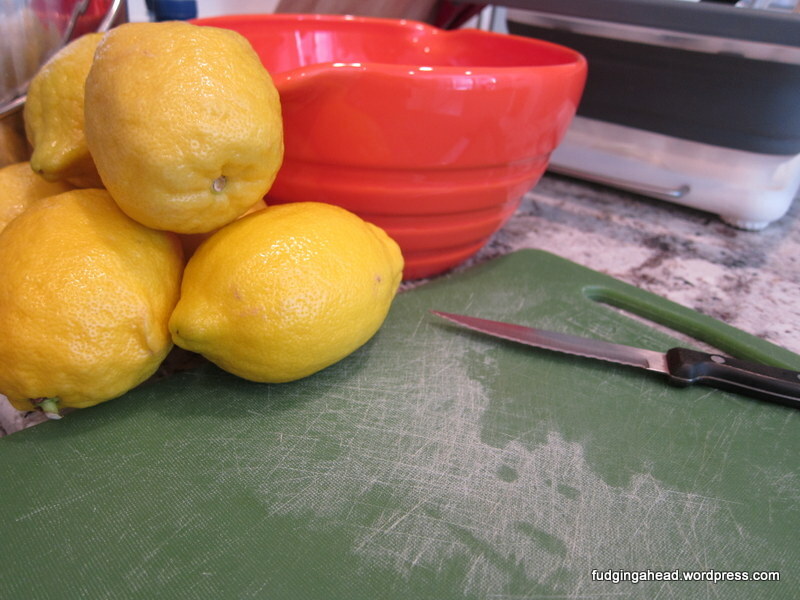 The funny part is that even though I’ve made all sorts of dishes, I had never made lemonade before, so I was excited to find some ideas and methods. 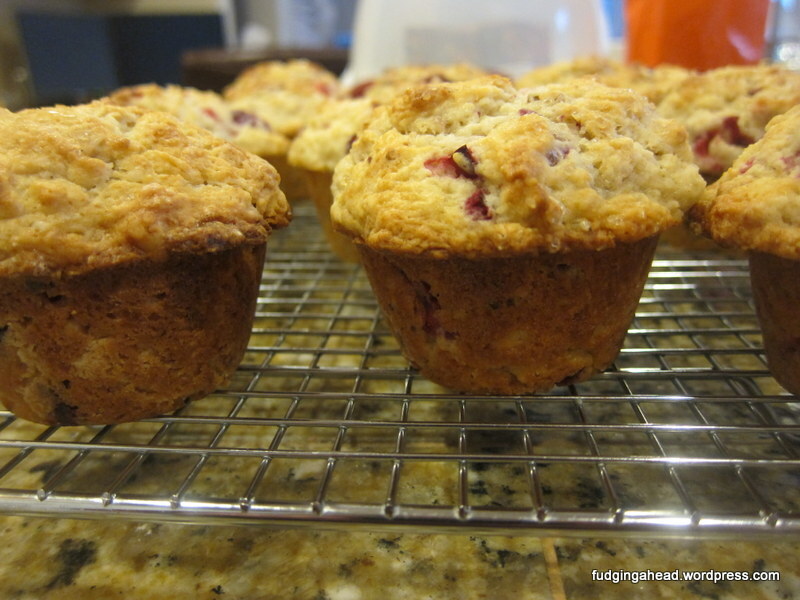 These muffins caused me such trouble and I am not even sure why. They’re simple enough . . .
Get your materials and recipe ready . 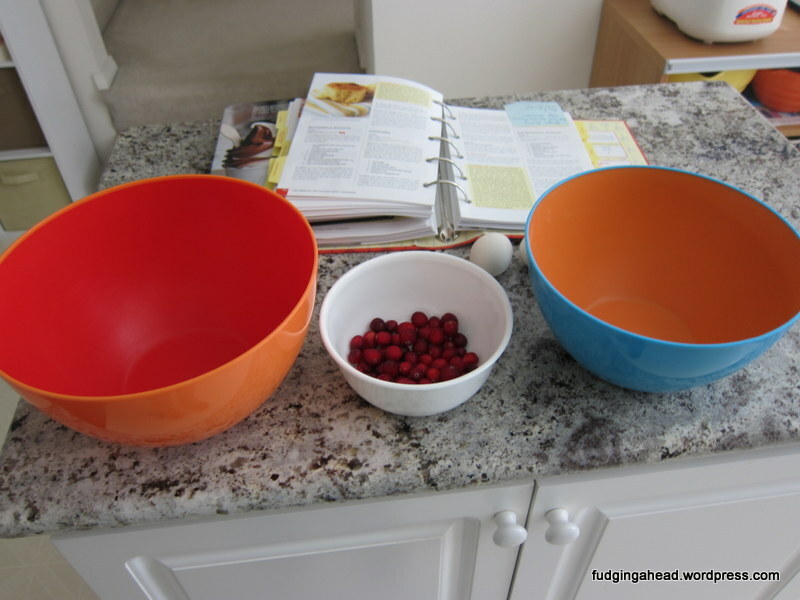 . .
Cranberries in one kind, jam in the other . . . wait a second . . .